There are few things more frustrating than being unable to get in or out of your home when you need to. While garage door springs can last for years, if they do break or malfunction, you will need to get them replaced as soon as possible. It's a good idea to know what to look for if you can't get your car in or out. If you are in your car and pushing the remote and nothing is happening, it is a good sign that you have a major problem. In addition, there are a few other signs that will let you know you need professional help, including damaged sections, broken cables, and gaps in your unit. Here we will take a look at the most common signs to recognize when there's something wrong with the springs. 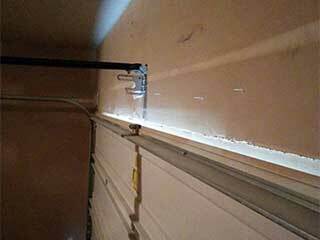 If your garage door drops suddenly when closing, it is a clear sign that something is wrong with one of the springs. If it's broken, the remaining spring won't be able to support the unit by itself to control the speed of the door when it is closing, causing it to slam down quickly into the floor. This can be dangerous, especially if you have children or pets who may be caught below it when it falls. In case it broke while the door is closed, you won't be able to open it. Loud noises coming from your garage when nobody is in there can be very disconcerting, but you will definitely want to check them out to make sure you will be able to get your car out the next time you have to leave the house. Sometimes the spring will actually break, which will result in a loud bang when the coils spin on the shaft it can be quite alarming. Rather than waiting until you need to go to work in the morning, if you hear this noise, you will need to investigate. If you think that you have an issue with one of the springs you will want to get professional help immediately so that any problems can be taken care of and you won't be stuck in your home or outside of the garage. Rather than trying to fix the problem yourself, you are much better off calling for help. It is easy to get injured trying to repair this issue by yourself, and most homeowners don't have the tools and equipment to be able to safely complete the work.